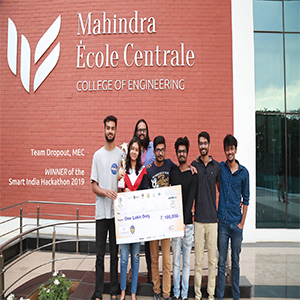 Students of Mahindra Ecole Centrale (MEC), a leading technology school, based at Hyderabad, have won the Smart India Hackathon(SIH) 2019. In order to make development a comprehensive mass movement and innovate on all fronts, MHRD, AICTE, i4c and Persistent Systems came together to organise Smart India Hackathon (SIH) 2019. SIH 2019 is a unique Open Innovation Model for identifying new and disruptive technology innovations to solve the challenges faced in our country. It's a non-stop product development competition, where problem statements are posed to technology students for innovative solutions. The 2019 edition of the SIH saw the coming together of 1 lakh+ students from 3000+ technical Institutes and 200+ organizations from across India. 35,000 teams submitted their entries for around 400 problem statements. Out of these, 1300 teams were shortlisted. Finally, around 4 teams were shortlisted per problem statement and 1 was declared the winner. “At MEC, our focus is on creating a well rounded engineering professional who will look at the existing challenges and then create workable solutions for them. Our team did just this and won the top honors for it. We are glad that our research focus is already beginning to yield rich dividends and our students continue to excel in whatever they participate in. Winning SIH 2019 makes us especiallyproud since this is by far the largest such event in India and puts us firmly in the centre-stage”, says Dr. Yajulu Medury, Director, Mahindra Ecole Centrale. MEC team "Dropout" that won the Smart India Hackathon 2019, was captained by Jayesh (Electrical & Electronics), and comprised of Rahul Kumaran (Computer Science), Hemanth (Computer Science), Artika (Computer Science), Karthikeya (Mechanical), and Soorya (Mechanical). All the students were from the 3rd year UG BTech program. Dr. Achal Agarwal of Computer Science Department and Dr. Bharghava Rajaram of Electrical and Electronics Engineering Department were the faculty mentors. MEC team worked on a complex problem shared by Aurobindo Pharmaceuticals and created a world class solution. The team created a Market attractive index for pharmaceutical companies using machine learning by capturing macroeconomic (business) variables and pharmaceutical data. This involved capturing data from relevant bodies, looking at variables like demographic features, disease, health care expenditure, etc. and integrating the data together for variable values corresponding to different countries and years. Then the data was cleaned in order to adjust the sparse values of the dataset. Finally, different machine learning algorithms were used to analyse the data while validating it with health expenditure (directly correlated with amount of business). Principal Component Analysis reduced the number of features (essentially the dimensionality) in the data and then running the algorithm made our prediction more accurate.